How many hats can one man wear? Well, if you’re Daniel Britt the answer may be, “How many hats do you have”? While publically Daniel is best known as the co-host of The Morning JoyRide he is also Joy FM’s General Manager. What’s more, Daniel is the VP of Culture Integration for Positive Alternative Radio. Now, Daniel won’t admit this, but he is a bit of a genius…a real life radio savant. He began his broadcast career at the age 14, taking on radio and TV gigs such as the Toccoa Falls College Radio Network, 13WMAZ-TV, Salem Communications, NewLife FM, and SiriusXM. What makes Daniel unique to Joy FM is his unbridled passion for Southern Gospel music. Not enough for you? 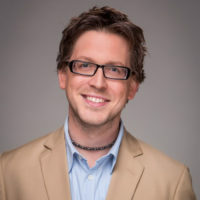 Well, Daniel is also an ordained Presbyterian elder, a featured writer for Homecoming Magazine, co-host of the syndicated radio ministry Sharing the Light and is an accomplished pianist. Check out my social page!